Osaka's Minami district is particularly tourist friendly and boasts plenty of entertainment, busy shopping arcades and many top nightclubs, which are centred around both Shinsaibashi and Namba. South of Minami lies another collection of sights to explore, being centred around the prominent Tenno-ji Station and incorporating the neighbourhoods of both Den-Den Town and Shin-Sekai. On the western side of central Osaka you will find the main bay area and a further set of top tourist attractions, including a popular family theme park and aquarium. A great way to find your way around the city is to pick up your free copy of the 'Osaka City Map', which is available at the tourist information centres and tourism bureaus at Namba Station, Osaka Station, Shin-Osaka Station and Tenno-ji Station. 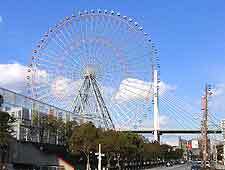 Around the city of Osaka, tourist attractions are plentiful and popular. 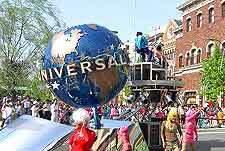 When visiting this exciting city, lookout for the Ame-mura (American Village), the roller coasters at the Festivalgate amusement park, the marine creatures and penguins at the enormous Osaka Aquarium, the vast bathhouse of Spa World, the exotic animals at Tennoji Zoo, and also the theme park rides at Universal Studios Japan. If Japanese gardens are your thing, then a visit to Tennoji Park is worth considering, with bamboo, maples, lanterns, clipped trees and pagodas. More information about Osaka Tourist Attractions. Much of Osaka's skyline is dominated by dramatic landmarks, both modern and historical. 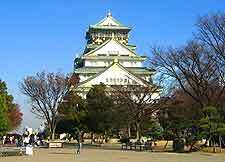 Osaka Castle is particularly impressive and dates back to the end of the 16th century. Even older, the Shitennoji Temple is the most historic temple in the whole of Japan and was built some 1,400 years ago. Two more modern structures towering high above the city are the iconic Tsutenkaku Tower and the World Trade Centre Cosmo Tower, where panoramic views across the Osaka cityscape are amongst the main highlights. More information about Osaka Landmarks. If museums and art works are what you crave, then Osaka will be sure to please. Whilst here, you will find museums concentrating on information about the cities main industries, including the Bicycle Museum Cycle Centre and the Mint Museum, where bicycles and local coins are produced respectively. For something a little different, the Osaka International Peace Centre actively promotes global peace and includes graphic information about the horrors of war, while for exquisite paintings and sculptures, the Municipal Museum of Fine Art and the National Museum of Art are bursting at the seams with exhibits from all eras. More information about Osaka Museums and Osaka Art Galleries. 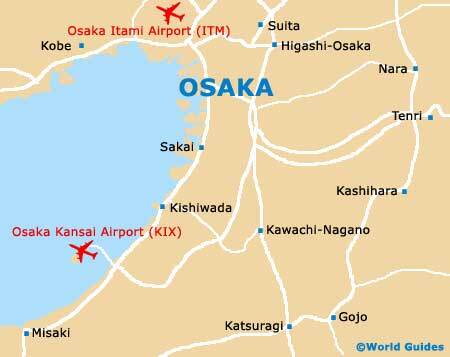 The city contains two large train stations within the Minami region, while the JR Osaka Station is located north, in the Kita district. The comprehensive rail network and numerous surrounding roads allow you to explore the many surrounding areas of interest. If you are looking to experience more of Japan, Osaka is particularly close to three major cities, which are cram-packed with outstanding tourist attractions and sights worth seeing. Located to the north-east of Osaka, Kyoto is home to more than 2,000 historic temples and shrines, while nearby Kobe enjoys a hilltop setting and is an important seaport city with a particularly beautiful coastline. 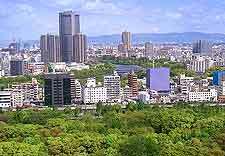 Also nearby, the city of Nagoya is amongst the best tourist destinations within the whole of the Aichi Prefecture and in home to the Atsuta-jingu shrine, the Tokugawa Art Museum and more. More information about Osaka Attractions Nearby.